Happy Release Day to Té Russ! 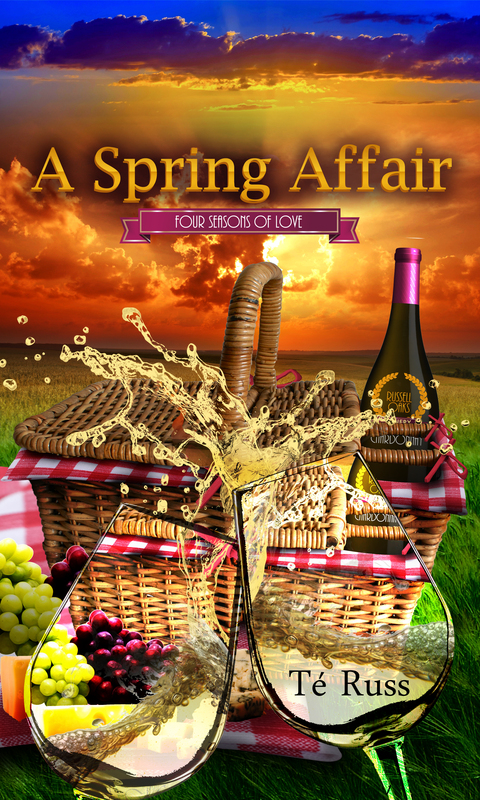 Her new release, A Spring Affair, is now available!! Though they’ve yet to meet face to face, Maya has had a secret crush on Xavier, the man who owns a wine café that the winery she works for distributes to. But being that Xavier is involved, she’d never reveal her feelings. Xavier’s previous relationship has left him wrung out emotionally. Needing to get away for awhile, he decides to drive to Napa and visit the winery that produces one of the best selling wines at his café. And finally get the opportunity to meet the woman with the sweet little voice. One email and four little words stands to flip their love lives on its head and when Maya and Xavier meet for the first time, both are blindsided by the attraction they feel for one another. Maya stood there in the wine cave staring at Xavier. She watched at the corner of his mouth quirked up slightly, before he released a deep chuckle. She wanted to get to know him better as well. Then why are you hesitating? her mind screamed. She looked over her shoulder at the exit, then back at the table. Maya grinned at Xavier’s inquisitive tone. They moved over to the table and Xavier held a chair out for Maya. As he pushed her chair in after she sat, she felt his finger inadvertently brush against her shoulder. It amazed her that even the lightest touch from this man made her body come alive. She expected him to go around and sit on the other side of the table, but was surprised when he pulled out the chair right next to hers and sat down. “So, what do we have here?” Xavier asked, rubbing his hands together in anticipation. Trying to ignore their knees touching under the table, Maya pointed to a white wine. “This is a chardonnay, much like the one you tasted from the barrel. Of course this one is ready for consumption,” she said with a smile. They both reached for the bottle at the same time and she stopped as Xavier’s large hand grabbed it first. “By all means.” She held up her glass so he could pour some, then he filled his own glass. “I assume we’re pairing this with the brie cheese over there?” he guessed as he sat the bottle back down. She loved his answer. And it was obvious that he was a true wine lover. As they went through their flight of wines, tasting several varieties, she watched as he described each one in great detail, as well as how each item of food was enhanced by the wines. As they finished up their tasting, Xavier wiped his mouth and sat his napkin down on the plate in front of him. “Even though it was meant for you and someone else?” she asked sheepishly. Xavier turned and looked Maya directly in the eyes. “If it was meant for me to be here with someone else, I would have been here with someone else,” he said with a self-assured tone. There was something in his voice and the look in his eyes that made Maya’s heart race. “I visited all of the ones on my list yesterday and today. This was the final stop for me. I wanted to save the best for last,” he said, and she felt like he was referring to more than just the winery. After years of fantasizing about this man she’d never before met, he was better than anything she could have imagined. And for all of those years, there was a road block in her dreams by the name of Darby. Now Darby was out of the picture and Xavier was showing interest in her. It was the stuff romance novels were made of. She remembered what her sister had said about jumping at the opportunity if it presented itself with Xavier. Well…she’d been a little more cruder, but still…her overall advice was on point. And Maya wasn’t going to let a chance she’d secretly been wishing for, for several years now, pass her by. Thanks for having me! And thank you about the cover! My awesome husband does the for me! You’re very welcome! 😀 And he did an excellent job!